Words and Flavours | Melbourne food and book reviews: Budapest III: Take away? It was just as well he did. We got another two meals out of the schnitzel, and the fairly robust plastic container he provided for the vegetables later gave passage to a rather exquisite apricot-jam-filled doughnut (from the bakery across from our apartment) for the overnight train trip from Budapest to Italy, and later to some flavour-bursting strawberries from Ravenna's covered market on a daytrip to the beach. 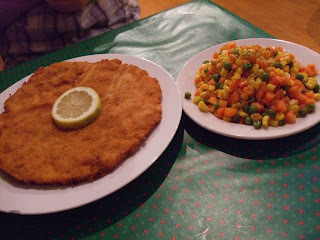 The schnitzel was part of dinner on our first night. The restaurant, Bécsiszelet, offered glasses of wine for 300 forint (ft), which equals about $AUD2. Not bad. Turns out, however, that the wine price quoted on a menu is for a set amount, perhaps 100ml or so. Hence, our generously sized glassed were in fact 600 ft. This was standard practice in most places we ate. 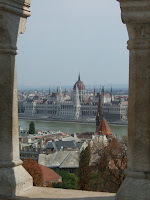 Another few words on Budapest's culinary nomenclature. Before leaving on this trip I'd discussed with a friend the difference in Australia between a cafe and a restaurant. We didn't arrive at a definitive answer. 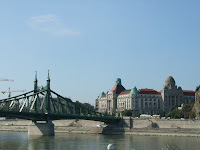 In Budapest, however, each type of venue is clearly delineated from others. A kávéháv is a coffee house, a simple cafe serving m ainly hot drinks. A cukrászda is a step up, serving cakes, pastries, strudel in addition to coffee. When it comes to drinking alcohol, a söröző is probably closest to our pub, whereas a borozó is more of a bar (of the games machine type). A restaurant might be a vendéglő - as were most that we ate at - or an étkezdék, probably what we'd call a cafeteria. And don't forget the Kinabufe: Chinese food served from a buffet. We didn't broach trying to decipher 'sweet and sour pork' in Hungarian!